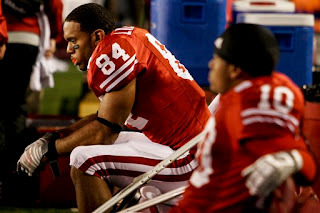 Badgers Fall Out of AP Poll ~ The Bucky Channel - The World of Sports from Wisconsin's Perspective. That's what two straight losses in the Big Ten will do to you, knock you right out of the polls. The Wisconsin Badgers were a top ten football program just two weeks ago, but are now on the outside looking in. This, after their 20-17 loss to Ohio State on Saturday. So the Badgers are technically the 26th best team in the AP Poll, but are still ranked at 24 in the USA Today poll. Either way, this season is pretty much lost. The loss to Michigan took them out of national title contention. The loss to Ohio State puts them out of the Big Ten race. And with a big game against number six Penn State looming next Saturday, things might not be getting better anytime soon. It should read "the Loss to MICHIGAN" .. not Penn St.
What an awful coach. Have a good luck with him for many years to come, Wisconsin football program!